I have a beautiful rare 21 Jewel 1948 8AE Bulova 10k GF Gold watch. It is running but needs a cleaning. All of the gears turn and the watch will tick for minutes or hours then stop. The case is in good shape, it has the band. The crystal has a couple of very small scuffs. the numerals are painted gold with a thin black outline. I am guessing it is a Dewey, Douglas, or His Excellency from the late 40s. Edit: Disregard above, there is now only this one record for subject watch. Hi Will, it's not a duplicate - Tom has just this one record in the dB. Hi Tom, welcome to myBulova. This is a very nice watch, thanks for sharing it. You're right in the similarities between the Douglas Dewey and His Ex. I see where you found this same watch in our dB identified as Unknown, mostly because of the dial. I guess we'll have to go back and research both of them. I guess this one goes Unknown as well, Too bad, it's a nice looking piece. I thought we had ID'd this case / dial combo as the Engineer. I agree with Shawn. Engineer fits the bil. Welcome to myBulova, Tom, that's a great looking watch. I always strongly recommend that vintage watches be serviced (Overhauled, a CTR, because they have probably been without any kind of maintenance for a long time) if you want to run them. A dirty, or dried out watch can and will damage itself if it is wound and run daily. A full service, or CTR, is full diassembly with cleaning in Industry standard fluids, inspection and repairs affected, with re-assembly and lubrification and de-magnetisation. This is followed by all necessary adjustments, both to the regulator pins, hairspring and in some cases, jewel endshake in chronometers. Mainsprings are usually replaced, and special lubricants are needed for automatic mechanisms. A common problem with very old watches is that after many years of service, the hairspring can be completely worn out and rubbery. 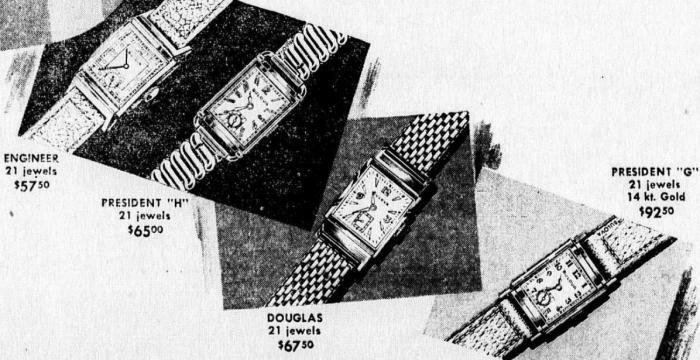 I see this most on wristwatches from the teens and twenties, and to a lesser degree in the 40's and 50's. This is due to composition of the springs, and just wear and tear. Once the hairspring is kaput, your timing will never be even close, and the only remedy is replacement. I recommend taking it to a certified watchmaker. A lot of jewelers nowadays send them out. First thing that should be done is get the date right. It's a 1948, not a 1946.